"This recipe is for enjoying the texture of eggs at the most tendermost but easiest level. It has the sweetest aroma I have ever tasted in eggs using the least ingredients." In a medium bowl, whisk eggs gently while slowly pouring in the chicken stock, sake, and soy sauce. Divide the mushroom and chicken evenly between two small tea cups. Pour the egg mixture into each cup until filled. Bring about 1 inch of water to a boil in a steamer or saucepan. Reduce heat to a simmer, and place cups into the steamer. Cover, and steam for 12 minutes, or until egg is firm but soft and silky like tofu. Garnish each cup with a sprig of parsley, and serve. 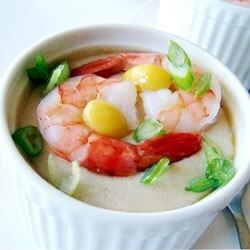 I have been looking for chawan mushi recipe and never got it correct. This is the first time i made it right. Thank you. The recipe is wonderful, the texture just right. Simple, easy and taste terrific. What else can you ask for? I substituted the chicken with shrimp and came out even betteR!